A thrombogenic vasculopathy caused by fibrin thrombi in the small dermal vessels of the lower legs, especially in older women, which are attributed to decreased fibrinolytic activity in the blood coupled with defective release of intrinsic tissue plasminogen activator from vessel walls. The typical lesions are telangiectatic purpuric papules and plaques which evolve into crusted ulcers that heal into atrophic stellate scars. 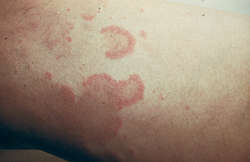 Patients may also have livedo reticularis, scleroderma, systemic lupus erythematosus and cryoglobulinaemia. A vasculitis with bloodclotting that affects small blood vessels in the skin, esp. near the feet and ankles. The cause in most cases is unknown, but it may be associated with diseases such as antiphospholipid antibody syndrome, systemic lupus erythematosus or scleroderma.